Roman emperor from AD 79-81, son of the emperor Vespasian, was born on the 30th of December AD 40 (or 41). He was educated in the imperial court, and thoroughly accomplished: he could speak Greek fluently and compose verses; he was a proficient in music; he could write shorthand, and imitate handwriting so skilfully that he used to say that he might have been a most successful forger. He was handsome and commanding, and had a vigorous frame, well trained in all the exercises of a soldier. As a young man he served with credit in Germany and in Britain. Soon he had the command of a legion, and joined his father in Syria, where he took an active part in the Jewish War. In 68 he was sent by his father to congratulate the newly proclaimed emperor, Galba; but, hearing of Galba's death and of the general confusion in the Roman world, he returned to Palestine, having in the meantime consulted the oracle of the Paphian Venus and received a favorable answer. In the following year Vespasian, having been proclaimed emperor, returned to Italy, and left Titus to carry on the siege of Jerusalem, which was captured on the 8th of September 70. On his return to Rome, Titus and his father celebrated a magnificent triumph, which has been immortalized by the so-called Arch of Titus. He was now formally associated with his father in the government, with the title of Caesar, and during the nine remaining years of Vespasian's reign he was in fact emperor. He was anything but popular; he had the character of being profligate and cruel. His connection with Berenice, the sister of the Agrippa of the Acts of the Apostles, also created a scandal; both brother and sister followed Titus to Rome, and were allowed to reside in the imperial palace. Public opinion was outraged, and Titus, though he had promised Berenice marriage, felt obliged to send her back to the East. Vespasian died in 79, leaving his son a safe throne and a well-filled treasury. The forebodings of the people were agreeably disappointed, for Titus put an end to prosecutions for high treason, and the delatores (informers) were scourged and expelled from the city. He assumed the office of pontifex maximus, in order that he might keep his hands free from blood. 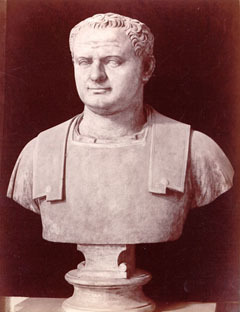 He forgave his brother Domitian, who more than once plotted against his life, and having let a day pass without bestowing a present, he exclaimed, "I have lost a day." Titus, like his father, spent money in adding to the magnificence of Rome. The Flavian amphitheater (later called the Colosseum) was completed and dedicated in his reign, with combats of gladiators, shows of wild beasts, and representations of some of the great Greek naval battles. He gave the city splendid baths, which surpassed those of Agrippa and of Nero, and supplied the mob with every kind of luxury. During his reign, in 79, occurred the eruption of Vesuvius which destroyed Herculaneum and Pompeii. The emperor visited the scenes and contributed liberally to the relief of the distressed inhabitants. During his absence a fire raged for three days at Rome, in which the new temple of Jupiter Capitolinus, the library of Augustus, and other public buildings were burned; then followed a pestilence, and Titus again assisted freely with his purse. Italy and the Roman world were peaceful during his reign. The only fighting was in Britain under Agricola, who in the year 80 carried the Roman arms as far as the Tay. Titus died on the 13th of September 81. The verdict of history is favorable to him, but the general feeling throughout the Roman world was that he had been fortunate in the briefness of his reign.